There's plenty of room for storage in these versatile workbenches, each with two gray steel base units placed back to back. All models feature a 2¼" (5.7 cm) thick Northern hard maple top with a durable natural finish. The overall top size is 64"W × 54"D (163 cm × 137 cm). Hann's Four-Station Workbench bases are constructed of heavy-gauge steel with welded seams throughout, offering years of reliable service. The sturdy locker doors are equipped with spring hinges. The overall base size is 31"H × 36"W × 21"D (79 cm × 91 cm × 53 cm). 12-Locker Workbench without Vises, Horizontal Locker — Two base units each contain six horizontal openings measuring 10"H × 18"W × 21"D. The locker doors include a padlock hasp and knockout for a cylinder lock. Shipping weight is 400 lbs (181 kg). 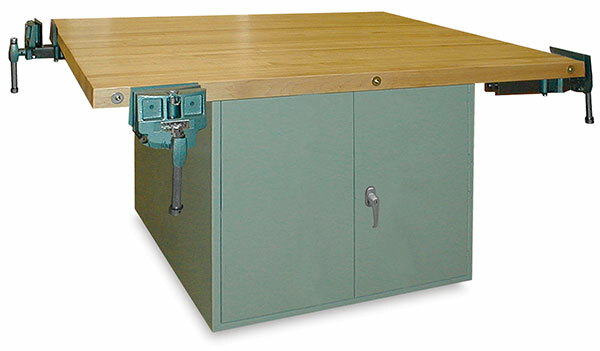 12-Locker Workbench without Vises, Vertical Locker — Two base units each contain six vertical openings measuring 15"H × 12"W × 21"D. The locker doors include a padlock hasp and knockout for a cylinder lock. Shipping weight is 412 lbs (186 kg). 12-Locker Workbench with 4 Woodworking Vises, Vertical Lockers — Two base units each contain six vertical openings measuring 15"H × 12"W × 21"D. The locker doors include a padlock hasp and knockout for a cylinder lock. Shipping weight is 532 lbs (241 kg). 4-Door Workbench without Vises — Provides large storage capacity. Two steel base units each feature two full-size doors fitted with keyed locking handles. An adjustable interior shelf keeps supplies organized. Shipping weight is 412 lb (187 kg). 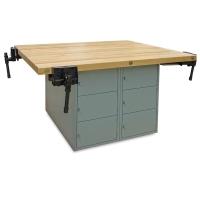 4-Door Workbench with 4 Woodworking Vises — Provides large storage capacity. Two steel base units each feature two full-size doors fitted with keyed locking handles. An adjustable interior shelf keeps supplies organized. Shipping weight is 504 lb (229 kg). 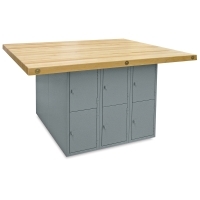 12-Locker Workbench with 4 Woodworking Vises, Horizontal Lockers — Two base units each contain six 10"H × 18"W × 21"D horizontal openings. The locker doors include a padlock hasp and knockout for a cylinder lock. Shipping weight is 563 lbs (255 kg).